This computer program is intended for homebuilders dreaming to design and build an experimental helicopter. The program calculates the performance of a helicopter once the design parameters are known. 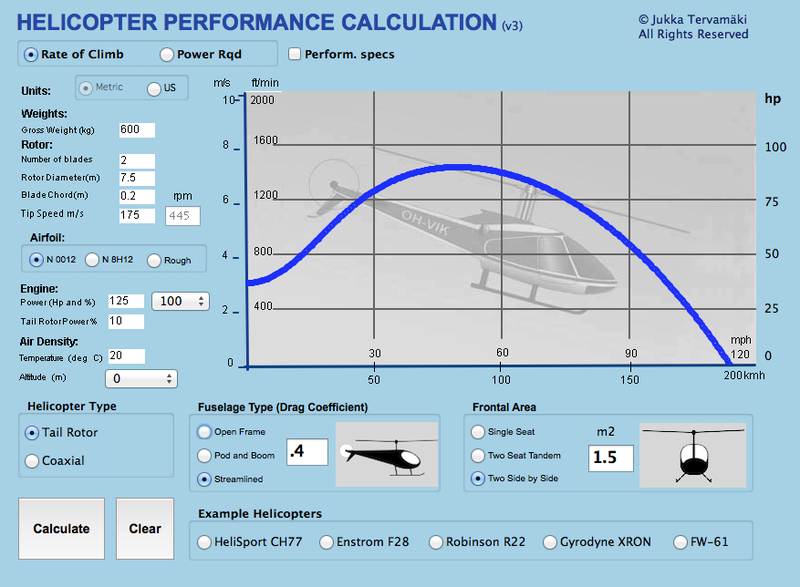 The ChopperCalc program could be used for small helicopters only. Helicopters with a gross weight of over 1200 kg or less than 100 kg are excluded. There are also limitations in other parameters like disc loading. The ChopperCalc program is an addition to my earlier work, the GyroCalc program to compute the performance of autogyros. To see the details of the program technical background, please, visit my Gyrocomp page. My first idea was to use the same computation method as described in the Gyrocomp page, i.e. the book "Aerodynamics of the Helicopter" by Gessow and Myers. The book is from 1952, well before the computer era. 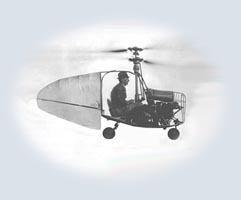 The mathematical background of the rotor aerodynamics were firmly established at the time but the actual work had to be done by manual computation using a slide rule or a mechanical calculator. This was the system when I first explored the the rotor aerodynamics. Today the G&M method could still be used but it requires quite a lot of programming effort due to the many numerical coefficients and tables. Actually I did the coding work but then I decided to do some googling to find if any new methods were available in the net. And I was lucky to find one! The above paper describes a reasonably simple mathematical method which was easy for computer programming. Like the G&M method the BU method requires mathematical iteration but in our computer era this is not a problem. Both methods also require many empirical coefficients and values which can only be found by computing the performance of some well known helicopter types. I now had two methods which were interesting to compare. However, I soon found the Belgrade University method to be superior for computer programming and continued using it thereon. Please, note the following remarks when using the ChopperCalc. 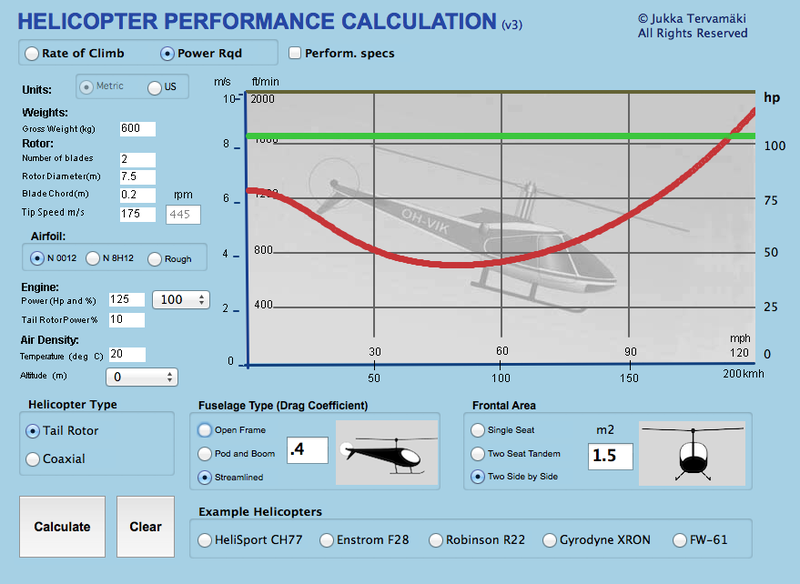 1) The ChopperCalc is intended to compute performance of small experimental helicopters only. Therefore I have set limits to the helicopter size, power, disc loading and some other input data. 2) Since very few experimental helicopters utilize twisted and tapered rotor blades, they were omitted from the program. For simplicity the calculation of the flapping coefficients were omitted as well. 3) The power off autorotation performance is not included either but could be computed by using my GyroCalc program. 1) Download the program into your computer. Choose the right version for your computer type, Mac or Windows! 2) Unzip the program file and place it into the destination (Applications) folder. 3) Carefully read the instructions below! 4) Input all the necessary dimensions and weights of your helicopter design into the appropriate edit fields and activate the radio buttons, check boxes and pop up menus as necessary. 5) Press the Calculate button and you will have your helicopter performance diagram which will tell you the maximum rate of climb and maximum speed at the given power and altitude settings. ChopperCalcWin.exe.zip, 2.6 Mb for Windows machines later than 2000. Units: Choose either metric or US units to type in your data on the white edit fields. Note the units in parentheses. Use decimal values for US units as well, e.g. decimal feet. Weights: Input the estimated gross weight. Rotor: The number of blades, rotor diameter and the blade chord are self explanatory. 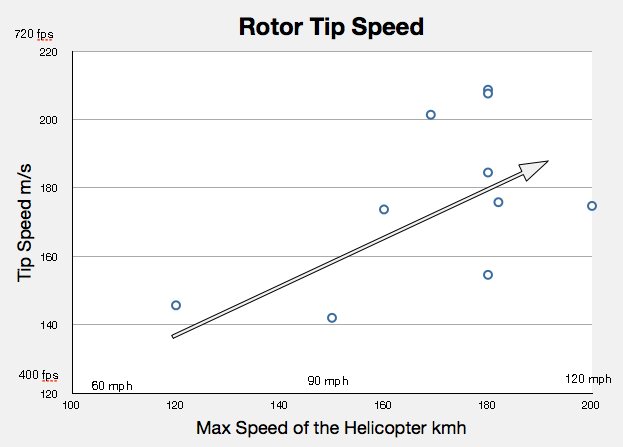 The default value for the rotor blade tip speed is set to 175 m/s (570 fps). You can adjust the tip speed until the wanted rpm value is reached. Generally speaking slow helicopters seem to have a low tip speed and fast helicopters a high tip speed. Three or four bladed rotors usually have a lower tip speed than 2-blade rotors. One method to choose the tip speed value for a new helicopter project is to compare similar size machines and replicate the rotor values. Airfoils: Rotor blade airfoil drag data for two airfoils is provided, the NACA 0012 and NACA 8-H-12. The latter one was specifically developed for helicopters in the early fifties. 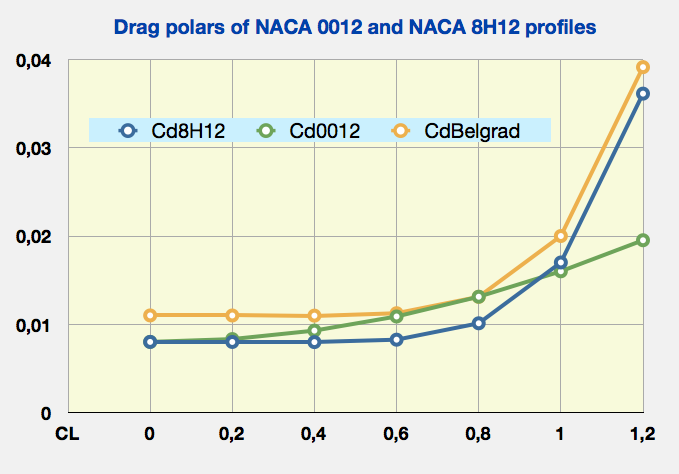 In addition the NACA 8-H-12 data is included with standard roughness (RadioButton: Rough) with a curve similar as shown in the Belgrad University report and in the NACA TN 1998. A normal 2nd power curve was used to simulate the NACA 0012 airfoil drag data while a 6th power curve was developed for the NACA 8-H-12 to simulate the abrupt drag increase at high lift coefficients. Air Density: Helicopters are sensitive to air density, and the performance deteriorates with increasing altitude and air temperature. If your airfield is high in the mountains in a hot place, type in the temperature value and choose the altitude from the pop up menu. Engine Power: Input the maximum power into the white field and choose the maximum continuous or cruise power percent from the pop up menu. Helicopter engines are sometimes derated for longer life or better altitude performance. In some helicopters the maximum power can be used for a few minutes only. Tail rotor and transmission losses: I have estimated a loss of 10% of the engine power for the tail rotor and a 5% power loss for the coaxial type transmission. Helicopter Type: The default type is the common tail rotor type helicopter but I have included the coaxial type, too. I did this with a simple assumption that the two rotors of the coaxial helicopter deal with the same air mass. So they could be considered as a single rotor with the number of blades combined. Of course, this is a very approximate assumption not optimized for coaxial rotors. Frontal Area: These radio buttons adjust the frontal area of the helicopter fuselage for drag calculations. The fuselage frontal area can be obtained by pasting the helicopter 3-view drawing into a 2D or 3D CAD program in proper scale and by drawing a circumference line around the front view. CAD-programs can calculate the surface area inside the closed line. Fuselage Type: These radio buttons adjust the drag coefficient of the fuselage for power required calculations. Be honest, if your helicopter is "boxy" or aerodynamically dirty (a lot of protrusions without fairings), jump one step upwards even if your helicopter has a fully enclosed cockpit. You can also type any value into the text fields provided. Choose either the Rate of Climb or the Power Required curve by clicking the appropriate radio button. 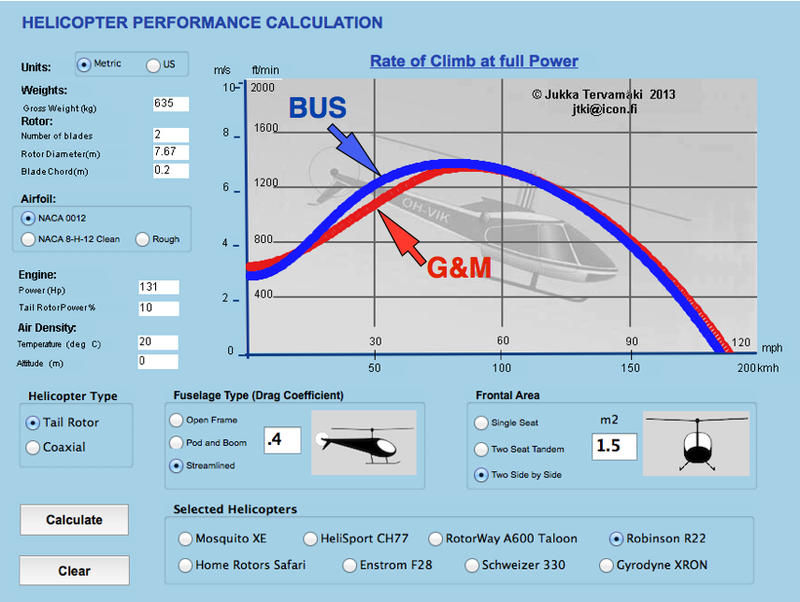 Press the Calculate button and the program calculates the climb performance of your helicopter in a split second. You can change your input data at will and recalculate new performance curves making comparisons of different choices. If the graphics window gets congested, press the Clear button. The vertical climb rate should be considered as OGE-value (Out of Ground Effect). If it is zero at certain altitude, the helicopter can still hover In Ground Effect (IGE-value). The Power required curve also contains two straight lines. The upper one (dark green line) indicates the maximum engine power at sea level typed into the Power text field. The lower (light green) line indicates the rotor power after air density (temperature and altitude) and tail rotor plus transmission losses have been taken into account. I have added five radio buttons to calculate the performance of some present day and past helicopter types. Just click one of the radio buttons and the weights, dimensions and other data will be filled automatically. Some of the data I had to estimate since I could not find the values in the net. If you know a better value (like blade chord), please type it in the field provided. If you want to see what are the published helicopter specs, check the Performance Specs Box and the program will draw short red marker lines for the maximum rate of climb and maximum speed. The Gyrodyne XRON-1 is an interesting example. The performance info in Wikipedia claims that its maximum speed is 125 kmh but ChopperCalc computes a maximum speed of 150 kmh. Then again there are videos in the net which claim a maximum speed of 180 kmh? There must be a bigger engine or a super charger installed? Another interesting example is the worlds first helicopter with practical performance, the Focke Fw-61. It had two rotors side by side and a 160 hp radial engine. For computation it could be considered as two helicopters flying side by side each rotor carrying half of the gross weight by using half of the power. With these assumptions and assuming very high drag values due to the two rotor outriggers the ChopperCalc computes a similar performance given in various sources in the net. The most reliable info source are several FAI helicopter world records the FW-61 set before the WW-II (an order of magnitude higher than previous ones). Two of the records could be tested with the ChopperCalc, the speed record of 122.5 kmh (1937) and altitude record of 3427 m (1939). For the first one just press the Calculate button to see the maximum speed. The second is computed by choosing 3500 m altitude from the pop up menu. At this altitude the FW-61 still seems to have some climb rate, especially if the weight loss due to the fuel consumed in the long climb is taken into account. Validity of the Results: So, I have tested the program with the data of some present and past helicopter types (or what is available in the net) and the computed results seem to fit the real performance data reasonably well. However, it should be noted that many of the necessary parameters are not published in the net. The rotor blade chord is seldom given in the specs and the fuselage drag coefficient could only be obtained by wind tunnel tests. Sure, the helicopter manufacturers know the drag data but it is not published anywhere. During the past decades I have been contacted once in a while by inventors with a great new helicopter idea. This program hopefully gives the inventors and dreamers a basic understanding of how much power is needed to get their helicopter off the ground, hovering and climbing. If nothing else, one can use the program for comparative calculations between various configurations or just as a "game". Feedback: Any new performance data is welcome. Especially if your data is in disagreement with the calculated values I am interested in making comparisons to adjust the parameters. To be really valuable, your data should include ALL data, those values which are shown in program input and output fields. Please, attach a photo of your helicopter as well. Notice! Arial font has been specified for the program. If you don't have this font, your system will substitute it with another font which might not fit all spaces provided. ChopperCalc was written and compiled using RealBasic 5.1 (http://www.realsoftware.com/realbasic/) in an Intel iMac computer. 1) I am very happy with results, they look pretty realistic for my project. I only can compare hover performance from my other calculations. The calculations in Boris Yurjev's book (1956) and Thomas Hanson's book, gave me the result of 24.8 HP for hover, about the same as ChoppereCalc. So again, Thank You! 2) HIENO systeemi. Paljon olet nähnyt vaivaa. Että kiitosta taas Jukka CopperCalcin uudesta versiosta. Muistan sinua tulevan kirjani alkulauseessa, (ollut työn alla vasta 10 vuotta): "Helicopter is merely an oscillating airfoil system".